2016 is the 400th anniversary of Shakespeare’s death, so, earlier this week, I hied me to Kings College, London to an exhibition by the College in collaboration with The National Archive. The exhibition displays a series of original documents, from the late sixteenth or early seventeenth centuries, either by, or about, Shakespeare. Only one of these documents was actually written by Shakespeare and we’ll come to that in a moment, but, in the absence of private papers or letters surviving, Shakespeare’s life is reconstructed from these other documents. This wouldn’t be the first time that a life was pieced together in this way. And documents have often inspired many a work of fiction too. So, here we have the bill of complaint, dated 1601, by Giles Allen, owner of the land upon which the Theatre ( one of London’s first purpose-built playhouses ) stood in Shoreditch. This is against Richard and Cuthbert Burbage, the brothers who built and ran the Theatre. 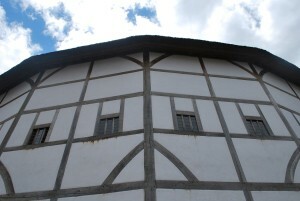 In 1585, following a dispute about the terms of the lease, a group of armed men audaciously dismantled the theatre, piece by piece, carrying off its timbers to be used in the construction of a new playhouse south of the river, called the Globe. Richard Burbage issued shares in his new enterprise to raise the money to get it going and some of the actors in the Lord Chamberlain’s Men, Burbage’s acting company, duly stumped up. Shakespeare was one of them. Henceforward, Shakespeare owned a 10% stake in the Globe, which proved increasingly popular. Then there is the testimony of Augustine Phillips, a fellow Lord Chamberlain’s Man, examined by Queen Elizabeth’s advisors after the company had performed Richard II ( ‘Let us sit upon the ground and tell sad stories of the death of kings’ ) for the Earl of Essex on the day before Essex openly rose up in rebellion against Elizabeth. The rebellion was quashed, but the theatre troupe were under suspicion for a while, the plot of the play being the overthrow of a ruling monarch by an aristocrat. Phillips managed to persuade his interrogators that the company weren’t complicit and hadn’t wanted to perform that play, it being considered less popular than newer works. They had raised their performance price by 40 shillings because of this. In fact the actors weren’t punished at all ( though Phillips probably sweated a pint or two ) and performed for the Queen on the day that Essex was beheaded. Life wasn’t all quite so adventurous. Shakespeare is called as a witness in a civil case against his landlords the Mountjoys ( he lodged in their house ) and his deposition is in the exhibition. Then there are royal court records, of Shakespeare receiving red cloth, with which to make a garment to wear, as one of the newly re-named ‘King’s Men’ theatre company, in the coronation procession of King James. He had joined the establishment. 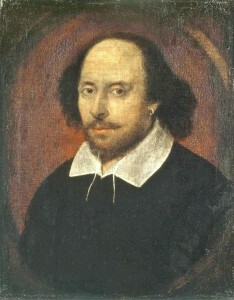 The centre-piece of the exhibition is Shakespeare’s will. It bears one of the few surviving examples of his signature. By the time of his death in 1616 he was a wealthy man. He had purchased a fine house in Stratford-upon-Avon, his birthplace, and bought more property to extend it. But he had no sons, his only son, Hamnet, having died in childhood. So Shakespeare left most of his property to his eldest daughter, Susanna, though his wife, Anne and his younger daughter, Judith also received bequests. Although phrased in the legal jargon of the day the will includes elements written, between the formal lines, in Shakespeare’s own hand, making specific and personal bequests, such a money to actor friends so that they can have rings made, by which to remember him. The exhibition runs until 29th May 2016 in the East Wing of Somerset House and costs £10 to enter. It’s worth a visit, for details click here. This entry was posted in Culture Vulture, History, London and tagged History, London by juliej. Bookmark the permalink.